Carmaker Vauxhall has confirmed 900 job cuts at its Ellesmere Port factory in Cheshire, warning the plant must further improve its productivity. The announcement was made after Vauxhall management and GM officials met union leaders at the factory. Derek Simpson, the boss of Amicus, said the decision was "another devastating blow to the car industry and UK manufacturing in general". The government said it would do all it could to help staff find new jobs. The 900 job cuts represent just under a third of the plant's overall 3,000-strong workforce. Vauxhall said it was switching from three to two shifts at the factory, which makes its Astra model. It said the move reflected the "ongoing pressure" in the car industry to increase productivity and reduce costs. Vauxhall chairman Jon Browning said the aim was to achieve the job losses at Ellesmere Port through voluntary redundancies. "We will, of course, work together with our labour representatives to achieve a socially-responsible solution for the affected employees," said Mr Browning. "For the people at Ellesmere Port, this is by no means indicative of a lack of progress made locally over the past several years. "Indeed there has been much progress. Quality and productivity have shown significant improvements, but the issue of long-term competitiveness remains. "We need to address this. This move will have positive effects on the cost structure of the plant." But Tony Woodley, general secretary of the Transport and General Workers Union, expressed dismay at the move. "This plant, our industry and our country cannot afford to keep shedding skills like this," he said. The 900 job losses will come into place when plant switches from three shifts to two at the end of August. Vauxhall's parent company, GM, the biggest US car company, is also cutting 30,000 jobs in the US on the back of falling sales and profits. Visiting Ellesmere Port ahead of the announcement, Mr Brown said he had travelled to the factory to offer any help the government could give. "We will do what we can to help each and every one of the workforce who may be affected by this announcement to find other jobs in the area," he said. Mr Brown added that the government wished to help both the company and the workers at Ellesmere Port secure the chance to build the next Astra model. Shadow Trade & Industry Secretary Alan Duncan attacked Mr Brown's visit to Ellesmere Port on Wednesday. "We all know that politicians have to make visits like this one," said Mr Duncan. "But it is very hard to see what this visit can achieve for the workers at Vauxhall. "We fear they are being given false hope, for the sake of a photo opportunity." 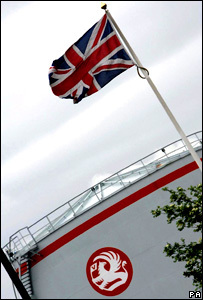 The job losses at Vauxhall are just the latest blow to the UK car industry. Last month French car giant Peugeot Citroen announced it was closing its Ryton plant near Coventry, with the loss of 2,300 jobs. And sports car manufacturer TVR said it was to shut its Blackpool factory, although it intends to relocate to a new site. Those announcements followed after last year's collapse of MG Rover, with the loss of 6,000 jobs in Birmingham.